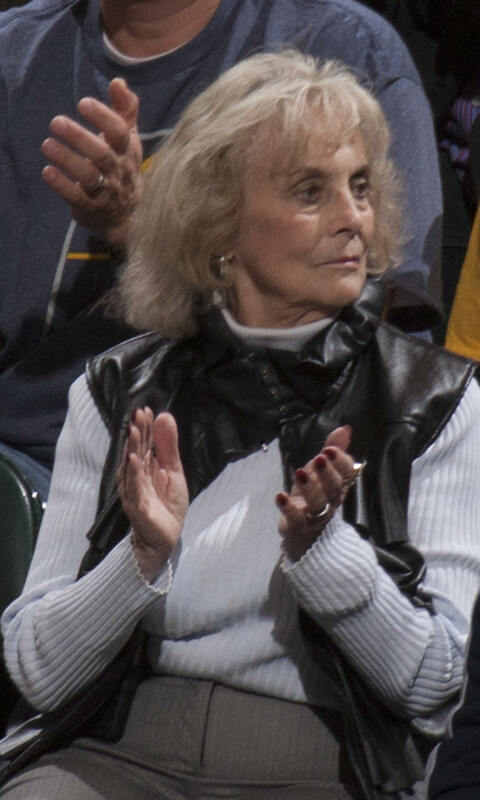 She’s an under-appreciated historical figure in Indiana for her contributions to the Pacers. She worked behind the scenes in the early years, and then was the assistant general manager until her husband, Slick, was fired as the coach in 1980. She ran a 13-member front office for five years, and apparently kept it humming under difficult circumstances. We talked in the living room of the Leonards’ home in Carmel, a home they built after they were convinced the Pacers would last. Later, she played a major role in assuring that the team would last in Indianapolis by organizing on short notice the telethon on July 4, 1977. She is nurturing, but also a bit intimidating, as Slick admits. Above all, she is competent. She and Slick raised five children while they were running the Pacers office, and she has done many things outside of basketball, too. Most recently, that includes being a standout real estate agent. I once drove Slick and her to Louisville for Ralph Beard’s funeral service. She sat in the back seat and worked all the way down. After this episode ran, one of the executives at FC Tucker called her and wondered why they had never made her a manager of some sort. She would have been a good one, I’m sure.